The Switch Module 063 can be used to control 230-V devices with the CoachLab II+ interface or the relay on the System Board. The module is based on a 230 V solid-state-relays (SSR). 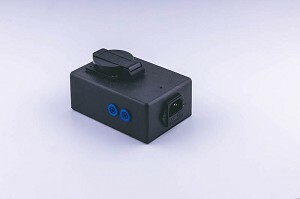 The relays must be connected to the 230V mains by a Euro-connector at the rear of the module. The relays can supply devices up to 1150 W. The 230 V switch is controlled by a voltage of 3 V or more (up to 25 V). Technical specifications of the Switch Module are descibed it its User's guide.